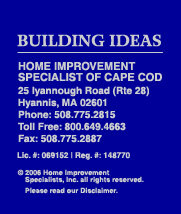 Since 1977 Home Improvement Specialists of Cape Cod, Inc. (H.I.S.) has helped thousands of customers improve their property. We pride on our ability to “Design and Build Ideas”, along with building long-term relationships with our clients. This approach has led to an impressive number of repeat customers. H.I.S. works hard to make your entire project stress and hassle free. We handle everything for you. This includes building permits, scheduling deliveries and inspections, adhering to all code requirements, finishing the last details and cleaning up after ourselves. Ask about our “Home Care and Repair” program where we provide the maintenance service your home needs. Whether it is painting, hanging gutters, replace rotted trim or roofing and siding, installing new counter tops or new floors the H.I.S. Team is here to help you. H.I.S. also has another program “Aging In Place” where we make your home more accessible and comfortable for you. We can move your laundry to the first floor, replace your old tub with an accessible shower, widen doors and install some grab bars. These changes can make life more manageable and give you the freedom to remain right where your memories are - at home. We are proud of our loyal and repeat customers and large referral business. References on all our work and site inspections are available. Free consultation is offered on any remodeling project. Complete building elevations and working plans are furnished on all our work. We obtain all building permits, schedule all inspections, and adhere to all local, state and federal regulations. H.I.S. is fully Licensed (MHIC 148770 – Lic. 061952) and insured. References and insurance certificates are available. H.I.S. is a member of the National Association of the Remodeling Industry. All work is covered by our limited warranty. Visit our showroom today at 25 Iyannough Rd. (Rte. 28) near the Hyannis / Yarmouth town line. Our Production Department is managed by professional and experienced people dedicated to quality workmanship and committed to our customer's needs. It is their goal to make your remodeling project a pleasant and enjoyable experience. Our communication and scheduling skills help to ensure that delays and interruptions are avoided in your life and are key to the job's success. All of our products have a manufacturer's warranty and our own two year warranty on labor and materials.